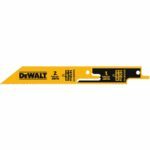 Dewalt announced a new Flexvolt 60V In-Line Stud & Joist Drill DCD470 at this years STAFDA 2018 event. 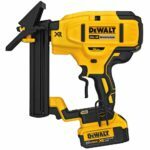 Dewalt created a new version of their current Flexvolt 60V stud and joist drill but this time around with an inline configuration. 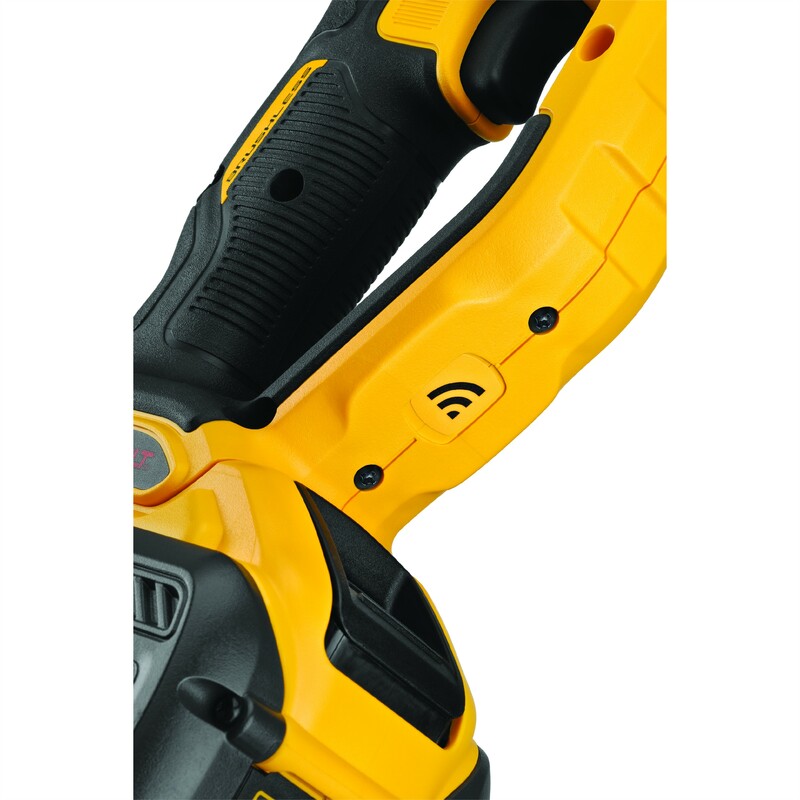 The first Dewalt cordless 60v stud and joist drill was more reminiscent of Milwaukee’s corded Hole Hawg while the new inline model is more reminiscent of Milwaukee’s Super Hawg design. 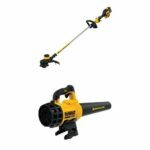 Dewalt just announced the new inline model and is up on their website however max hole size drilling stats are unavailable but the two speed drivetrain RPM’s are similar so I would assume it’s as powerful as the first cordless Dewalt 60V stud and joist drill which is good for drilling large holes up to 6-1/4″ hole saws in wood and 4-5/8 self feed bits in wood which is very impressive for a cordless tool. 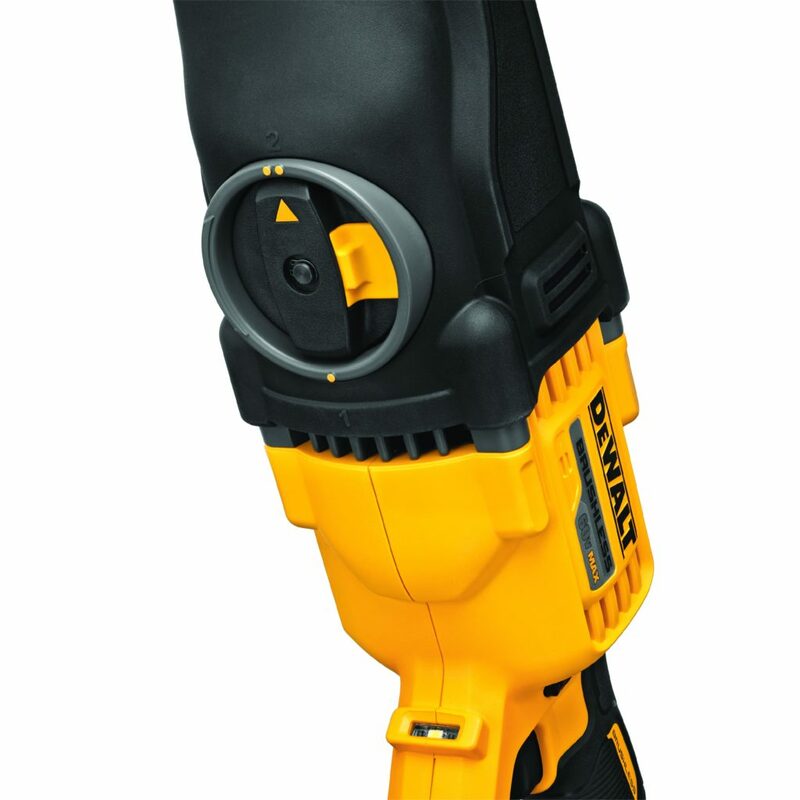 It has an E-Clutch system that stops the tool when the bit binds to protect the users arms and shoulders from snapping just like the original cordless stud and joist drill. 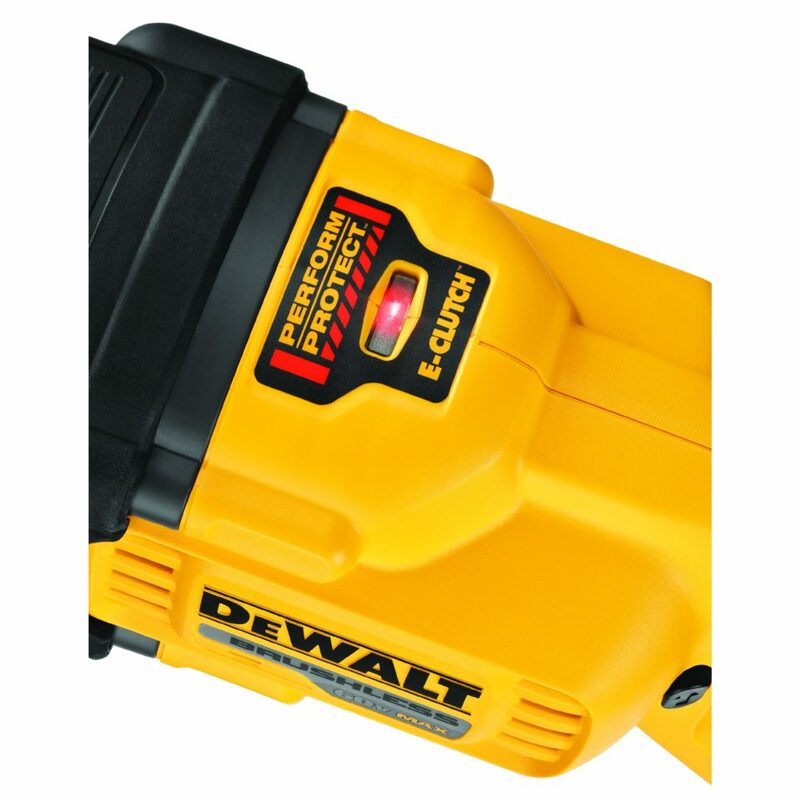 The user is notified that the E-Clutch System has been activated through an illuminated LED light which is at the top of the tool above the handle. 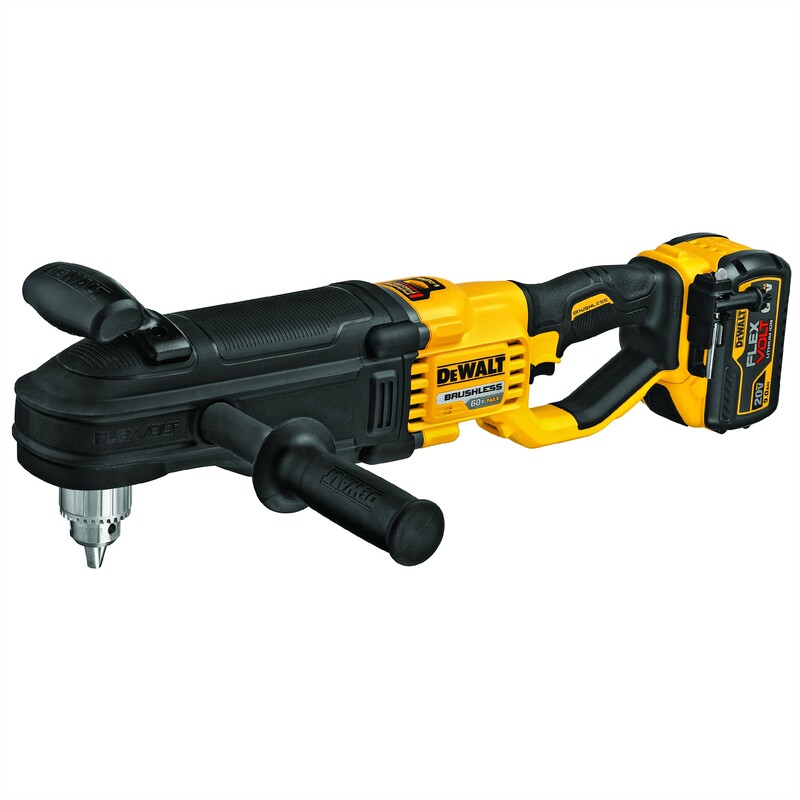 The Dewalt 60V MAX In-Line Stud & Joist Drill also features the 2-speed Quick-Shift which allows the user to easily shift between two speeds without having to feather the trigger. The drill also includes a 2 position side handle for left and right hand positioning, a shallow nose to get into tight spaces, a 1/2″ keyed chuck and chuck key holder, an LED to illuminate work areas, a knuckle guard to help protect the user’s hand, and Bluetooth Tool Connect Tag (sold separately) mount. With a rounded top handle and rubber handle over-mold, it is easy for the user to find the right grip. 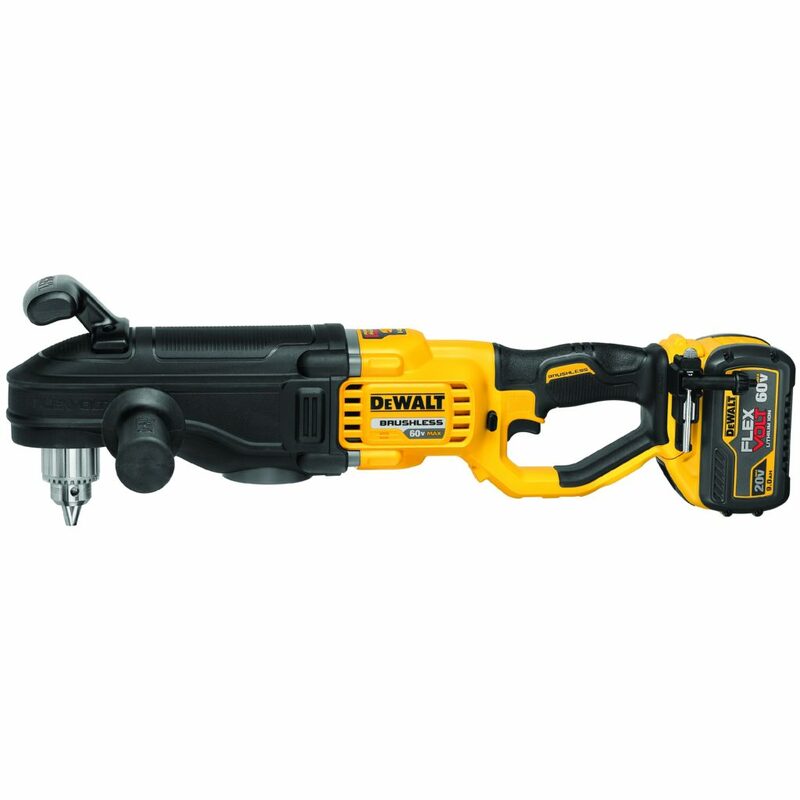 The Dewalt Flexvolt 60V MAX In-Line Stud & Joist Drill will come as a kit with one 9.0Ah FLEXVOLT® Battery, Charger, and Kit Bag for $549 ( DCD470X1 ) and as a bare tool for $399 ( DCD470B ). It will come standard with a three-year limited warranty, one-year free service contract and 90-day money-back guarantee. 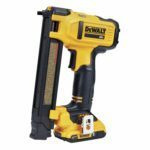 In addition to the integral clutch, the DEWALT anti-rotation E-Clutch System, offers technology capable of detecting the motion of the tool. This feature senses the motion of the tool and shuts it down if necessary . The red indicator LED illuminates when the E-Clutch® System is engaged. Magnesium gear case to reduce weight while maintaing jobsite durability. Tool Connect™ Tag Ready. Installing a DEWALT Tool Tag allows for tracking and locating of the drill using the DEWALT Tool Connect ™ app. Quick-Shift Speed Selector allows the user to easily change speeds without having to feather the trigger. I’m curious if this is a legitimate upgrade to the dcd460, or just a form factor change? I don’t know that I’ve ever been able to find hard data on the torque spec of the 460. This looks great either way. And I’d like to think with this being a gen2 tool and DeWalts improvements with 60v that it should be head and shoulders above the fuel superhawg. We’ll see. If they give us capacity ratings for various types of drilling in wood/metal then we can better understand if it’s a performance upgrade or not. Neither their website listing for this tool nor their press release have any info regarding performance so for now it appears to be only a form factor change from the info we have so far. Even if it we’re just a form factor, I’ll likely be buying one lol the hole hawg is one of my last remaining Milwaukee’s. The first gen joist drill is no slouch already, but given the great improvement from the gen 1 sds max rotohammer to the new gen 2 shown at this years concrete event, I expect good things. Thanks for the coverage.